Douglass Bailey gave a great brown bag lecture at Berkeley on Wednesday titled, Neolithic architecture and 1960s art: ground, surface, dissection, and allocentric frames of reference. He was throwing around ideas about a new book he is writing that explores modern art (specifically “land art”) as a way to frame our thinking about archaeology. 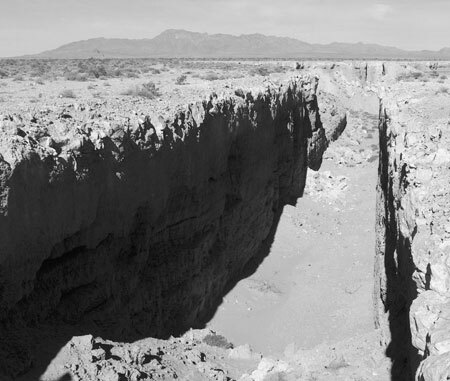 Indeed, Heizer’s Double Negative looks very much like a trench at first glance, but where trenches generally make me happy (just try to keep me out of any one that I see), Double Negative is actually wounding to contemplate, even on the computer, hundreds of miles away. It could be the scale, or the sheer needlessness of it, I’m not sure. Heizer succeeded, obviously. Anyway, Bailey’s talk was interesting and provoked a lot of discussion at the end, about negatives and pit houses. As a graduate student, it’s always educational to see how exactly invited speakers respond to questions and criticism–I’ve seen some people very nearly flip out, get really emotional and just refuse to answer any more questions, some people give fairly deadpan answers, but Bailey (and, actually Alison Wylie did this as well) would take notes, and took the time to talk/think through the question with the person who asked the question. It is a nice style, and it seemed to turn the lecture more into a working group than a jury of your peers, something that could actually give good feedback instead of people trying to look smart by stumping you with difficult questions. I’m getting better at public speaking, but am still nervous when it comes to talking about my ideas in front of my own department. Give me a conference or a classroom any day! I’ve long fantasized about an earth art road trip to see Double Negative, Smithson’s Spiral Jetty, De Maria’s Lightning Field and Turell’s Roden Crater, but I don’t think i could handle all the driving. Heh — you should be nervous; question sessions there are a blood sport. I’m glad to hear someone was managing to turn it into a collegial activity, rather than the combative “my brain is bigger than yours, fear me” sort of thing it often devolves into. And Wylie is a class act. I have always liked Alison Wylie (from afar and through her words, since I’ve never met her) – I’m glad to hear she is what she’s always seemed to me. I find Double Negative disturbing. Maybe a bit hypocritical of me…as I earn some of my daily bread by digging smaller holes in the ground and thereby disturbing the nearby ecosystem. 1) you as speaker know more about your subject than any one in the audience (if not then you shouldn’t be giving a public lecture about that topic). 2) you should look at the chance to give a Brown Bag or seminar as a chance for you (!) to learn something…ask the audience to contribute to your work (and then take their comments seriously). 4) 20% of your audience will love you, 20% will hate you, and the remaining 60% won’t be bothered one way or the other (and it doesn’t matter what you lecture about or how well/badly you do it). 5) you only need to worry if no one asks any questions. Jesse – I need about a year in the SW to see everything. I’m hoping to at least have a roadtrip down there in the next couple of years. Sara – Don’t I know it. AM8 – I think that’s some of the fascination I have for it. I make a living creating (or perhaps re-creating) voids, but I still find Double Negative disturbing. Dr. Bailey – Thank you so much for your comments! I think it’s point one that I worry the most about, at this stage. So good to talk to you, and hope to see you again soon.